Devin Fore's "An Introduction to Kluge and Negt" first appeared in October 149, Summer 2014 (published by The MIT Press), and it forms a part of Fore's introduction to the MIT edition of History and Obstinacy. To mark the release of Verso's Radical Thinkers edition of Public Sphere and Experience, we present it below. Since it first appeared in 1981, History and Obstinacy has been increasingly recognized as the most ambitious formulation of Negt and Kluge’s philosophical project, developed over three decades of close collaboration. It has been justifiably heralded as the missing half of Capital, a project that was outlined in the Grundrisse but that remained unfinished by Marx at the time of his death. If Capital attempted a foundational analysis of the forces of production in diverse objective formats ranging from factory machinery to communication technologies, but left the organic dimension of capitalism largely unexamined, History and Obstinacy turns its attention to the other, human side of political economy: the living forces of production, the anthropology of labor power, the soft tissue of capitalism. It takes seriously Raymond Williams’s insight that “the most important thing a worker ever produces is himself.” What happens, Negt and Kluge ask, when we apply the theoretical tools of Marx’s analysis not to dead labor but to its living and breathing counterpart, to the human subject? The answer in History and Obstinacy is a breathtaking archaeology of the attributes of Western man as they have developed over the last two thousand years. Like their previous book, Public Sphere and Experience (1972), History and Obstinacy was designed to “open the analytic concepts of political economy downward, toward the real experience of human beings,” although this time Negt and Kluge have extended the analysis of human capital all the way down to the lowest strata of unconscious thought and cellular life, penetrating into the deep accumulations of genetic memory and the slow pulse of evolutionary time. Unlike fixed capital, whose historical development follows a swift tempo that is mechanical and predictable, human capital for Negt and Kluge is an unstable assemblage of disparate and often ill-fitting components, some flexible and some obstinate, some acquired (for example, education and socialization) and some endogenous (for example, genetics and anatomy). Together, all of these elements form a delicate, dynamic, and highly reactive subjective economy. While machine capital does not observe any inherent limits or proportions — it accumulates exponentially in the manner of a logical algorithm — living labor, by contrast, always follows principles of measure. It possesses a sense of balance that capital lacks. And this is one of the things that make History and Obstinacy’s proposed analysis of the political economy of human capital such a Gordian task, for unlike the simple linear development of fixed capital, living labor power inhabits multiple dimensions simultaneously (sensory, intellectual, psychic, physiological), many of which are incompatible with one another, but all of which are together subordinated to a basic law of self-regulation. Within the metastable system of the organic subject, each force always summons an equivalent counterforce that Negt and Kluge call “balance labor.” The laborer meets every abstract operation with a corresponding feat of concretion, every process of violent expropriation with an act of intransigent willfulness. In this way, homo compensator, as Kluge sometimes calls this creature, establishes the equilibrium that is necessary for its survival in the world. In order to understand this complex subjective ecology, Negt and Kluge extend the parameters of labor far beyond the limited forms of valorized work normally recognized by classical economics. For them, political economy must address not only the mechanisms of production and their quantifiable output in terms of manufactured commodities; this analysis must also take on the qualitative counter-strategies that the working organism develops in its need for self-regulation and stability. Negt and Kluge provide a concise Denkbild, or thought-image, for this compensatory reflex: a female welder who pauses intermittently at work to sweep her arms back “in a winglike fashion,” “as if she were flying” (p. 22). Here the factory system of mechanized labor provokes a corresponding act of balance labor in the working subject, a Deleuzian becoming-bird that counteracts the becoming-machine of the Taylorized workplace. Accessing a remote ornithic evolutionary memory located deep within her body to relieve the tension accumulating in her muscles, Welder responds to capture with flight. In this respect, notes Kluge, “the balance economy is in fact a real economy, albeit with its own specific conditions” (p. 45). * In order to provide a properly dialectical account of the labor process, Kluge and Negt thus attend to the multifarious compensatory activities that, despite their historical nonidentity and apparent incommensurability, are all nonetheless contextually necessary to maintain the logic of capital and perpetuate the relations of production: not just the physical labor of the assembly-line worker, then, but also, for example, the cognitive labor of the intelligentsia, the affective labor of the circus performer, or the reproductive labor of the parent. In an effort to establish a unified platform for political coalition from within the personal experience of multiplicity and diversity, Negt and Kluge turned their attention in History and Obstinacy to the subjacent qualities and traits of subjectivity (Eigenschaften), those elementary particles out of which the more complex molecules of psychological identity and character are assembled. For Negt and Kluge, political analysis today requires redefining, above all, the scale of the human. Indeed, one of the most striking features of their method is the unusual granularity of its analysis, which, eschewing the mesocosmic dimension traditionally associated with the humanist individual, explores the linkages between “cellular forms” of hegemony and the social totality almost entirely without recourse to the mediating authorities of consciousness and subjectivity.‡ For despite its compelling simulation of historical dynamism, the territory between micropolitics and totality — the space of the subject, of ideology, and of politics in its current spectacularized form — is in fact a dead zone in which nothing is taking place. As Negt notes, “Real movement occurs in the whole and in the microstructure; the microstructures and the whole are mutually dependent. Official politics is a synthetic midway level, where there is least movement, most of it is only a semblance of movement” (p. 74). If history is unfolding, then, it is not here with “us,” at the midway level, but in the spaces below and above it, which are determined by the qualifications, affordances, and even desires of individual Eigenschaften. “Real historical developments do not move on the side of the ‘complete person’ and ‘whole proletarian,’ but on the side of their individual qualities.” These qualities, each of which constitutes a “splendid natural force in its own right,” are the actual quanta of human history, while we personages are merely their vehicles. I don’t know of a single example of socialist behavior that was sustained for a long period of time. Evidently no vessel has been found for it yet. If the bourgeois subject is not a new characteristic [eine neue Eigenschaft], but the sum of all preceding characteristics placed in a new vessel, then the worker that is expressed in acts of mutually coordinated labor –– the spontaneous worker — is himself a character utterly distinct from the bourgeois. The worker lacks the aspect of accumulation: He is more powerfully at home in the moment and in the felicitous venture, which is to say, he is a character type that is thoroughly and powerfully rooted in the economy of pleasure [Lusthaushalt]. This is what is new about him. Here Kluge touches upon a persistent asymmetry that has dogged Marxist theory: Whereas the capitalist, a position defined by the economic mode of production, has a political and psychological counterpart in the bourgeois subject, the working class, also an economic category, has until now had no such equivalent representative in the realm of political ideology.§ Underwritten by a wealth of cultural technologies ranging from the bildungsroman to single-point perspective, the bourgeois self learned several centuries back to stand at the center of its universe and say “I,” or ego. But the vital question, posed by Negt and Kluge at the beginning of “Elements of a Political Economy of Labor Power,” is whether capital is itself similarly capable of doing so. In other words: can the proletariat become a stable and self-identical subject? According to Negt and Kluge, the answer to this question would have to be as much evolutionary as revolutionary. With good reason, they seldom romanticize political convulsions as punctual breaks with the past: years such as 1789 or 1917 may possess great symbolic power, but there is little to be learned from singling these dates out paradigmatically. For no revolution can be consummated in one calendar year. Politics is instead “a slow and powerful drilling through hard boards,” to recall a phrase of Max Weber’s that has returned in Kluge’s recent work. On this point, Kluge invokes the work of two Proletkul’t theorists, Aleksandr Bogdanov and Aron Zalkind, who estimated that socializing the objectified forces of production (that is, machinery and technology) would require a mere seven years, whereas socializing a new human subject — forging a stable psychological vessel for the marginalized proletarian traits — would take at least ten times as long. Regime change and technical revolutions are relatively swift affairs, but social revolutions have an exceptional Zeitbedarf, Kluge writes: they “need time.” Redesigning the affections and pleasures of a population, their intractable habits and everyday comportment, demands an intervention that is nothing less than evolutionary in scope. And without the psychosocial reconfiguration of the subject and her essential powers, no political revolution can succeed in the long run. * “The methodological difficulty of developing a political economy of the labor force is as follows: Since capital reduces the labor force to an abstract expenditure, we are dealing with an object of knowledge that is more or less uniform; there is only one political economy of capital, only one law of motion observed by the capitalist mode of production. But the political economy of the labor force behaves in an entirely different way: This is not a matter of simply describing capacities or of objective laws of motion that have been split off from the subject, but instead involves two aspects, namely the subjective and the objective at the same time; for this reason, every subject-object relationship that is caused by the exteriorization and separation [Äußerung und Entäußerung] of a social labor force entails its own specific law of motion. Just as there is one political economy for the body, there is also one for intelligence, one for the psychic apparatus, and one for the senses.” Oskar Negt and Alexander Kluge, “Maßverhältnisse des Politischen,” in Der unterschätzte Mensch, vol. 1 (Frankfurt am Main: Zweitausendeins, 2001), p. 772. Translation by author, as are all translations here, unless otherwise noted. † About the consumers of capitalism’s industrial culture, Bertolt Brecht writes: “Since the object of exploitation is put inside them, they are, so to speak, victims of ‘imploitation’ [Einbeutung].” Brecht, “Der Dreigroschenprozeß. Ein soziologisches Experiment,” in Werke: Grosse kommentierte Berliner und Frankfurter Ausgabe, ed. Werner Hecht, vol. 21 (Frankfurt am Main: Suhrkamp, 1988), p. 476; Brecht, “The Threepenny Lawsuit,” in Brecht on Film and Radio, ed. and trans. Marc Silberman (London: Methuen, 2000), p. 170. ‡ Even the highly segmented and discontinuous style of the book itself, which oscillates between the extreme abstraction of the main philosophical text and the extreme concretion of the anecdotes and illustrations, seems designed to bypass these mediations. As Christian Schulte suggests, it as if “the materials themselves are talking to each other” (p. 76). § Symptomatically: “As a singular substantive which implies the representation of a personality responsible for a historical mission,” the word proletariat “almost never appears in Capital.” Étienne Balibar, “The Notion of Class Politics in Marx,” trans. Dominique Parent-Ruccio and Frank R. Annunziato, Rethinking Marxism vol. 1, no. 2 (Summer 1988), pp. 19 and 18. 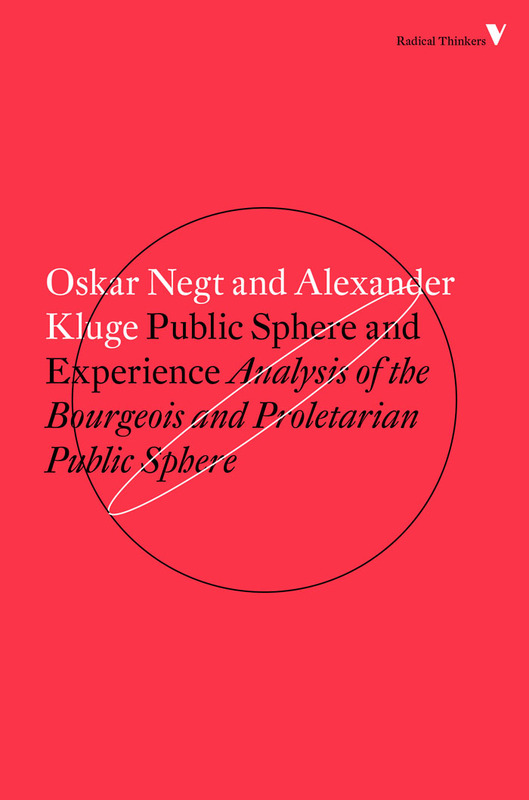 The Radical Thinkers edition of Kluge and Negt's Public Sphere and Experience was published earlier this month.